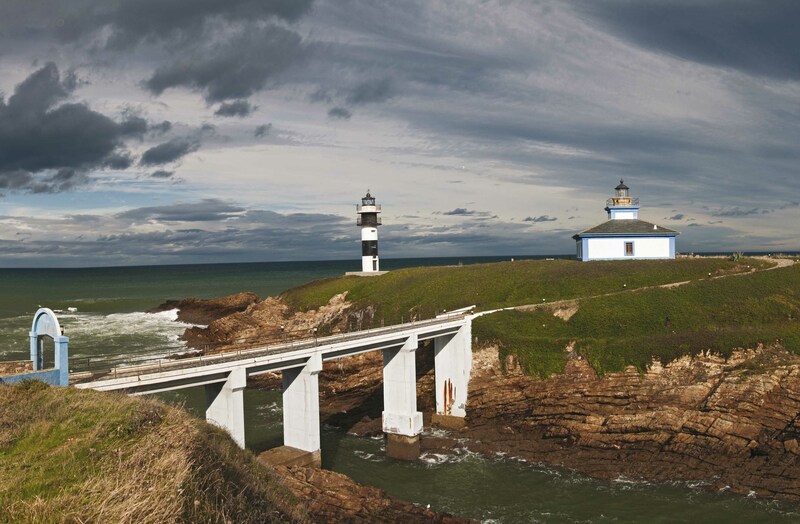 Ribadeo is the easternmost town on the coast of Lugo. Historic and very well connected, it is an ideal place to spend the day walking along the seaside. The most popular of the routes departing from the village is the one that leads to the Illa Pancha lighthouse, crossing through O Cargadoiro park. The appropriate thing is to start off from the Ribadeo port itself, downhill from the town center. The so-called Estrada do Faro (lighthouse road) borders the coast on the tail end of the Eo River. Throughout the journey we can be seen from Castropol and Figueras’ town centers, on the Asturian side of the estuary. The Eo is a short river that runs along the border between Asturias and Galicia, fierce and steep in its higher section, but calm once it approaches the Cantabric sea. Proof of this is the inlet of sea into the land, used since ancient times to shelter boats from the common fury of the ocean. Until not so long ago, crossing the estuary was only possible by travelling inland, to the narrower natural pass of Vegadeo, a stretch that is well worth a visit on its own right. Everything changed with the construction of the great Os Santos Bridge, which hangs just above the Estrada do Faro. Opened to the public in 1987 and recently widened to accommodate the highway’s four lanes, its construction completely changed the way people travelled in the region. Just before reaching it one must pass by the small San Miguel chapel. The small park of O Cargadeiro is close by. The name refers to the main construction in the area, which to the unacquainted visitor will look somewhat like a metal bridge that goes into the estuary but was never finished. This is not the case: it is the place where ships were loaded with ore coming from the Vilaodriz mines, uphill. Ore was the area’s main trading product and, during the first half of the twentieth century, a railroad that carried it down from the mine, in the municipality of A Pontenova, to Ribadeo operated. Several panels were installed in the area to explain how loading was done, directly onto the ships located beneath the industrial facility. A little further down stands another piece of history of the town of Ribadeo and all of eastern Galicia: the San Damián Fort. It is a military fortification from the early seventeenth century that was tasked with protecting the natural entrance to the Eo estuary and the towns on either side. Located in a strategic enclave, it was attacked several times. At present you can visit the interior. There is now less than a kilometre left to reach the route’s destination, and it goes by very quickly while travellers take in the ocean views, the Asturian coast and the whimsical shapes that waves have carved into the coast. Rock is soft in this area, unlike the granite that dominates most of the Galician coast, and, having been constantly beaten by the sea, it has formed outcrops in the shape of needles and arches, the most famous of which are those of the nearby As Catedrais beach. Finally, after a turn in the terrain, the small Illa Pancha lighthouse appears, painted white and blue and outlined beautifully against the sky. Recently, it has been refurbished as a hotel establishment and the really good views are those seen from the viewpoint above. From the platform you can see the wide bay formed by A Mariña de Lugo’s east coast and Asturia’s corresponding west coast..